I've always been a fan of videoke. I'd take an opportunity to hold a microphone and punch codes for a song whenever I can. While some regard this karaoke till the end of time as an annoying Filipino habit, we can't help but sing, whether in tune or not. But opportune moments for singing, err.. videoke doesn't come by often these days. So when my husband suggested we bring home our own set, I didn't hesitate to agree. This is the brand currently being endorsed by Anne Curtis, who popularized the other side of Pinoy singers - not so much into the technicality of singing but just belting out a song for the love of it. While another brand is actually more popular, we settled for this because there were more songs included in the set (a free USB with more songs also comes with the purchase) and the aesthetic side is more appealing. 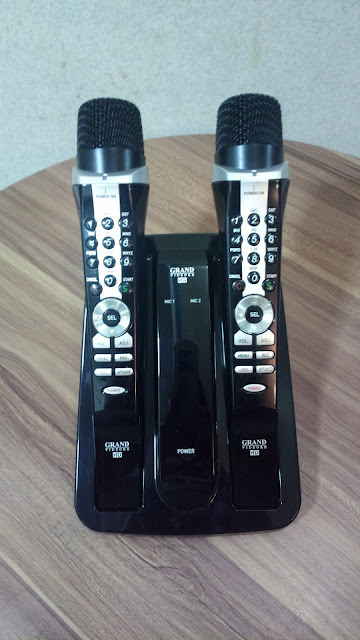 Even the design can be easily stored compared with the other brand which features microphones that are standing on the base, making it more challenging to find a spot for it underneath a limited TV table. It's also a bonus that we were able to score a good deal without the need to pay in cash. It didn't took me long enough to learn how to use the entire set. All controls are embedded onto the microphone sets. I forgot the sales representatives instructions and I need not use any manual. I just tinkered with the control buttons, experimenting how to switch from one function to another without messing up the entire system. You can change the video background, choose various song types (not genre) like the usual karaoke and then there's multiplex or vocally aided song, and choose how to search for a song (title, artist, even by lyrics). These and more can be done. As for the audio quality, the volume is definitely loud enough to be heard from nearby unless you sing in a whisper or adjust the volume. The sound gets even better when you connect it with a sound system. It can even make me sound better than I am! See video below. 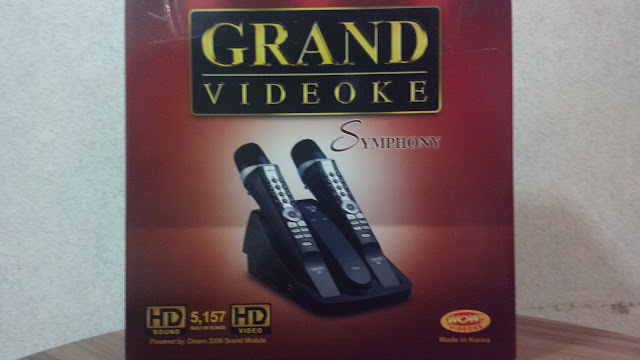 Grand Videoke is definitely worth the purchase for any weekend or holiday karaoke marathon staycation at home! For more information on this product, see www.grandvideoke.com .